Buying good stocks as Investments is always advisable. However all traders & investors face the issue of capital being locked up & miss out profitable trades due to lack of margins. Missing out on good trades because of a lack of margins is now a thing of the past! 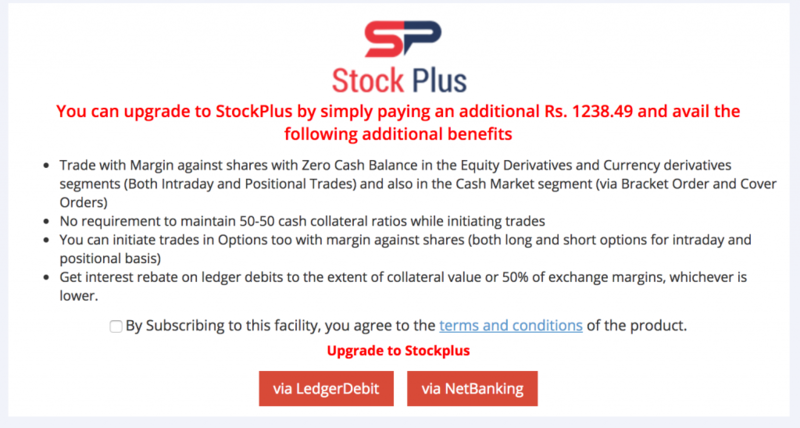 Now with SAMCO StockPlus, simply pledge your shares with SAMCO & make positional trades even with A ZERO CASH BALANCE. You can place Cover & Bracket Orders with a Zero Cash Balance solely with the margins against shares. You can initiate intraday and positional trades in the equities derivatives and currency derivatives segments with margin against shares. You can trade options (Long and Short – Intraday and Positional) with margin against shares. 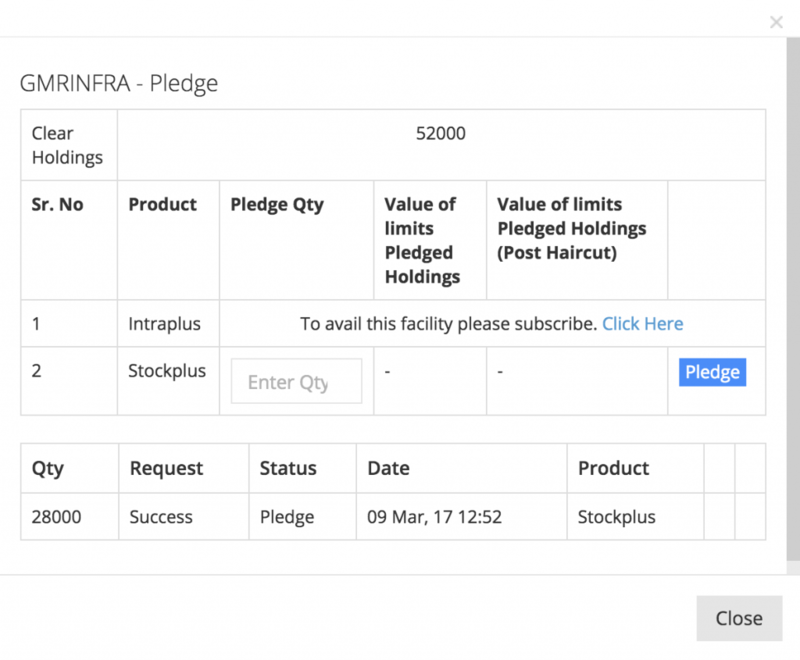 You can sell Pledged shares using SAMCO StockPlus within half an hour using the “Instant Release Request” option. Else you can Unpledge shares and get them available for sale the next day. You can subscribe to SAMCO StockPlus from the SAMCO Star Back Office by paying a fee of Rs.1,500 plus Service Tax. Note that you can subscribe either to SAMCO StockPlus or SAMCO IntraPlus. One cannot subscribe to both products at the same time. Once you login to the SAMCO STAR – you can select your margin against shares product. In case you are an existing SAMCO IntraPlus subscriber, you can upgrade to SAMCO StockPlus by paying the differential fee. Let us explain with an example: If you subscribed to IntraPlus by paying Rs. 1000 on October 1, 2016 and upgraded to StockPlus on 1st April, 2017, then the pro-rata unutilised amount of Rs. 500 (for 6 months) would be offered to you as a rebate and you would be required to pay only Rs. 1000 (Rs. 1500 – Rs. 500 rebate) plus applicable taxes and your subscription for StockPlus would be valid for a period of 1 year from 1st April, 2017. The subscription fee can be paid from the SAMCO Star Back Office. A sample screenshot looks as below. How can you Pledge & Unpledge shares? You can pledge and unpledge shares from the SAMCO STAR Holdings Menu. You can pledge from a list of over 820+ stocks. 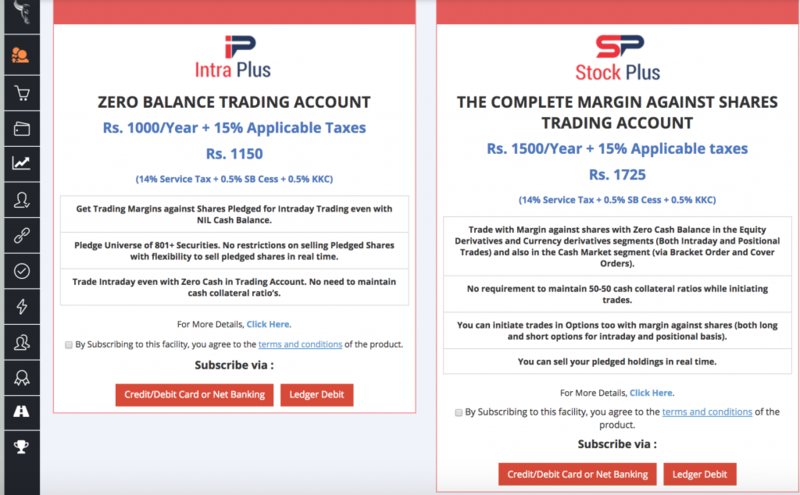 You can check the full list of stocks for margin against shares from our StockPlus calculator. 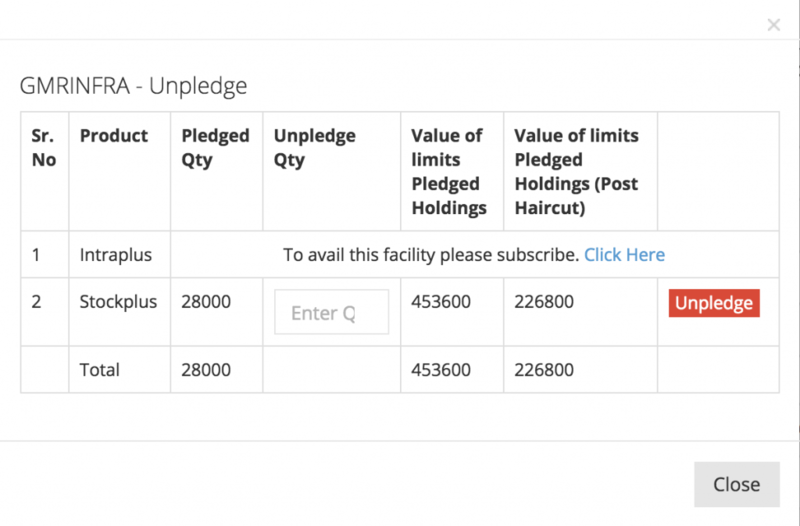 How can you view your Pledged Holdings & margins in SAMCO Trader? Your collateral trading limits will appear under RMS View Limits under the “Adhoc Margin” column. In case you are unable to view this column. Kindly right click, select “Reposition Columns” and add “Adhoc Margin” to the view screen. How can you view your Pledged Holdings in SAMCO Star? How can you place an Instant Release and Sale Request? Clients can place an instant unpledge and sale request from the SAMCO STAR dashboard. Once you enter your quantity, you shall be asked to confirm and enter an OTP. Once you enter the correct OTP, your request will be processed. Once a request is submitted, it cannot be cancelled. Also, until the request is processed, clients will not be able to enter another unpledge/sale request for the same stock. Requests will be processed in a period of 30 minutes from the time of submitting the requests.